Preparing for work in Australia. 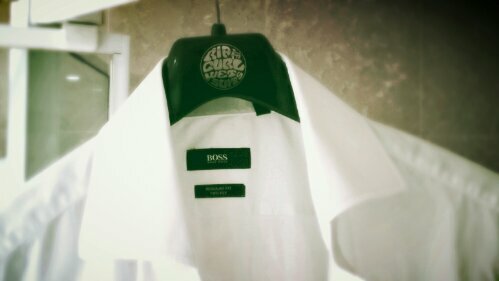 After washing my dress shirts it’s time to hang them to dry on Rip Curl Wetsuit hangers. Never did that in Sweden. This entry was posted in Off Topic, The Big Adventure and tagged Australia, TBA, work on 2013-09-12, Thursday by Stefan Johansson. Moving up in the world! Apparently there are subtle differences between Australia and Sweden. Apart from the fact that they are pretty much on opposite sides of the Earth there are some climate and ranking differences. 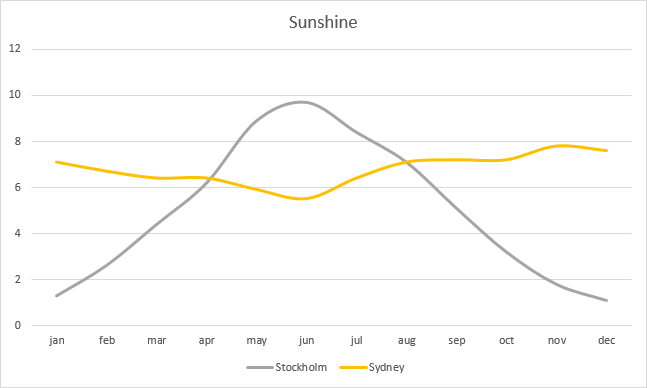 One obvious difference that comes from the fact that Sydney is on a different latitude, ~33.51° south compared to Stockholm on ~59.19° north. Stockholm is fairly close to the Arctic Circle whereas Sydney is closer to the Tropic of Capricorn. This means that the amount of sunshine every day differs slightly as seen in the chart below. Another difference that has received some press lately is the fact that the only country in the world that is happier than Sweden happens to be Australia. If we are to move from Sweden, what better place than the only place where people are happier. It has been published by the Wall Street Journal here (h/t to Johan), by BBC News here (h/t to Herbjörn) and in Swedish by DN here. The data comes from this OECD web site that actually has a pretty neat visualization and the possibility to change the relevance of several different dimensions to check how the different measured nations stack up to each other. Looking at some other measures the move from Sweden to Australia might be more of a problem, unless you love your work. This publication (note: pdf link) details the number of paid vacation days in different countries and here we see a dip from Sweden’s standard 25 days to Australia’s 20 days. There are however some paid holidays in Australia but that doesn’t really matter when compared with a normal Swedish employment. Another bonus available in Sweden is an additional bonus pay for vacation periods, something Austria seems to excel at but seems to be completely missing in Australia. Another well-known difference between the countries are the abundance of lethal animals that roam the streets looking for an easy prey. In Stockholm (read more: Sweden in a nutshell) we have plenty of Polar Bears (similar to Iorek but not as nice) and the poisonous Mooses/Elks with razor sharp antlers. In Sydney we expect to meet drop bears, Bunyip, Yowie and quite possibly a few other locals. This entry was posted in The Big Adventure and tagged Australia, Observations, Sweden, The Big Adventure on 2013-05-29, Wednesday by Stefan Johansson. It’s time for The Big Adventure (again). Time to show all of the kids more of the world. We are relocating to Australia in September 2013 and will initially settle in Sydney. Visas, tickets etc. are all set and the only things missing at the moment is a perfect job and a perfect house. If you are in need of a very accomplished CTO, Principal Consultant, Senior SharePoint Architect, Senior BI Architect or a Trainer/Mentor please contact me, I am available for discussions now. If you know of the best places to work and live in Sydney (or elsewhere in Australia), please feel free to contact me or leave a comment below. This entry was posted in General, The Big Adventure and tagged Australia, Relocating, The Big Adventure on 2013-03-09, Saturday by Stefan Johansson.